If you’ve been following me for a while on Instagram, you probably already know my serious love of the Three Dark Crowns series. I read the first book when it came in the September 2016 Owl Crate and instantly fell in love. Then I had to run out and read Kendare Blake’s duology, Anna Dressed in Blood, because I just needed more of her work. 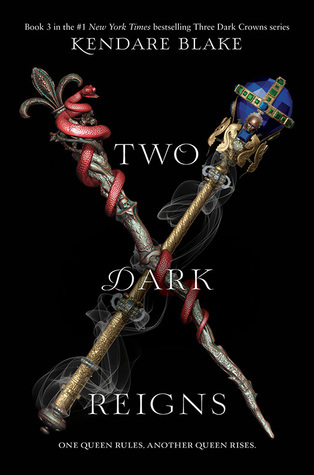 Now, we’re two years from the release of the first book and we’re finally getting book 3, Two Dark Reigns!! I couldn’t be more excited and I’m practically counting down the days. Synopsis: Katharine sits on the throne, Mirabella and Arsinoe are in hiding, and an unexpected renegade is about to wage a war of her own. The crown has been won, but these queens are far from done. That’s one of the shortest synopsis’ I’ve ever seen. But given it’s the third book, we don’t want any spoilers! Yay!! Which queen is your favorite?? OmG. Don’t. Just don’t ask this question. I really can’t chose till now. I love all of them so much. Maybe I will have a favourite after second book. Who is yours?